FOCI is very active in providing educational opportunities for those in need in India. Our view is that education is a necessary tool to begin to break the cycle of poverty and despair that disadvantaged families deal with every day. Below are some of the programs made possible for those who currently have so little…. 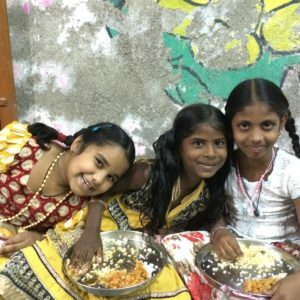 Lotus Learning Center – dinnertime! 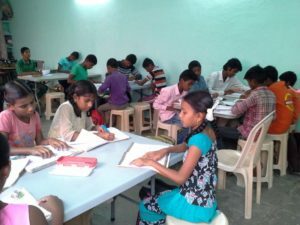 The Lotus Learning Center (Hyderabad) opened its doors in 2013 in the Kukatpally neighborhood of Hyderabad, welcoming in children of deeply impoverished families. At the Lotus Center, children receive afterschool tutoring from trained teachers, as well as a nutritious meal. And they have fun! Moosapet School (Hyderabad). This public girls’ school has become a place near and dear to FOCI’s heart. Each year, we provide a tutor and study materials for all the girls in the 10th (graduating) class, to help prepare them for the all-important Tenth Class exams… which determine whether they will be able to continue on to higher education. Tsafe in est results have improved markedly since our support began; and in addition, FOCI has provided funds to clean and maintain the school, so that the girls feel comfortable and their surroundings. In 2018, FOCI “adopted” a second government school, in the neighborhood of Nehrunagar, providing the same level of support to students and teachers. 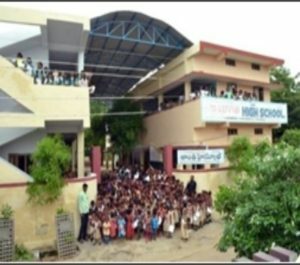 The Shanthi School – Khammam. The Shanthi (“Peace”) school began as a one-room schoolhouse, meeting for classes in one of the newly- built Habitat homes. Soon, a piece of property nearby was purchased through a grant from an American donor, and three classrooms were built. Over the years, more classroom space has been added as funds have been available. Now, all these years later, the school is a lively, thriving school for K through 10. Open to all children, the school is a great source of pride to the neighborhood — and to us! 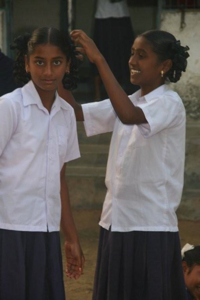 Getting ready for school at the Girls’ Hostel! Boys’ and Girls’ Hostels in the village of Gollapudi (near Khammam). There are many rural families who want their children to attend school — but simply can’t afford the cost of books and uniforms, not to mention the loss to the family income when a child who could beg, farm or clean wants to go to school. Our hostels take the burden off the parents by providing a place for children to live and learn together, attending local schools, and working with our tutors in the evenings. They love being there together — and we love their enthusiasm! The children are visited by family members as often as possible, and are able to go back to their homes for holidays and family events.